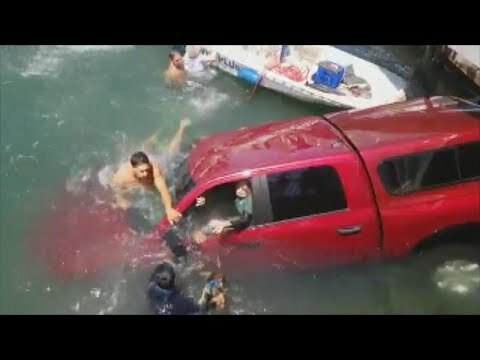 Dramatic footage shows good Samaritans rushing to help a mother, son and their dog, after their pickup truck plunged into a marina after crashing through a railing in California Saturday. Video shows the good Samaritans jump into the marina in Long Beach and work frantically to save the vehicle’s occupants as the truck begins to fill with water. The terrifying plunge happened when the truck, which was parked, suddenly lurched forward, launching right through a railing.